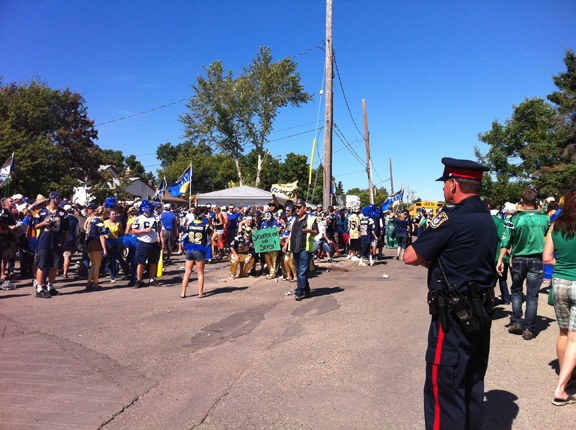 On Sunday I made the 2.5 hour drive to Regina, not for the legendary football game itself, but rather the legendary tailgate party. It was a cultural mosaic of Labatt's drinkers vs. Pilsner chuggers, a sea of emerald green awash with some of the best costumes I've seen this side of Halloween. My father, a devout Bombers fan, joined me becoming the target of more than a few good-natured taunts and Monty in his wee Rider jersey could be a popular mascot should something happen to Gainer during hunting season. No matter what side your allegiance stood, in the end a good time was had by all...except those losers from "Swaggerville". Bring on the Banjo Bowl!